Here's a list of useful apps for phones that run on Google's mobile platform. Business is shifting to a more immersively connected state, where everyone knows where and what everyone is doing at all times. We are sharing statuses, updates, files, directories, location check-ins and a host of other personal things about our lives and business. And if you work in a professional environment and travel, you likely know the feeling of being disconnected from your office, tools, family and friends. There are a number of apps highlighted in my book, "The Best Android Apps," that are not overly complicated, use the powerful features of Android and should give you a bit of productivity boost. The very first app you should install is Barcode Scanner. With this app, you can simply scan the QR Codes and go directly to the app's installation page. Click, scan, install is all you will need to do. My pick for the best travel companion app is ALOQA because it lets you "Always Be Local." 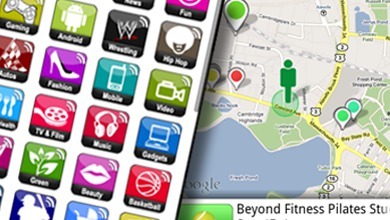 Using your GPS to determine where you are, this app will find activities, events, stores, restaurants and a host of other things in your vicinity. I find this a great way to get more connected to a city that I am visiting. Last time I was in San Francisco I found a yoga studio in the Mission District that was a great stress reliever. Be a local, get this app. My pick for the best file-sharing, management and storage tool is GoAruna because it is simple, intuitive and liberating. If you have ever been somewhere without your laptop or access to your files, you would have no problem if this app was loaded on your phone. Before you leave on your next trip you could simply drag and drop files that reside on your Mac, Windows or Linux computer, and you will have them accessible wherever you have your phone. The business app I use the most is EverNote. It's great for taking notes in meetings and also lets you embed voice recordings, pictures, Web pages and pretty much anything you want to make your notes more complete. The app is location-aware and provides access to your notes on pretty much any device (iPad, iPhone, Android, desktop, laptop). Whether you are trying to find a misplaced phone or a perfect place to relax while traveling on business, there are plenty of Android apps aimed at boosting your productivity, or alleviating some of the trepidation and lost time that business travel may cause. Mike Hendrickson is the co-author, with Brian Sawyer, of Best Android Apps. He has held a variety of positions in the publishing industry including product development manager, editor-in-chief and most recently associate publisher at O'Reilly Media.